The key to selecting a top guard dog is to match your needs against the natural tendencies bred into the dog. To do this you need an understanding of what the dog was bred to do and the traits that are literally programmed into his DNA. What Breeds Make Top Guard Dogs? The important thing to consider when choosing your own guard dog, is how to match the guard dog's natural, inbred inclinations with your family's needs. When choosing, do your research and consider many breeds before making your final decision. There are several breeds of dog that make for an excellent guard dog. The Bullmastiff was bred in 1860s England to guard large estates. They were known for pinning and holding intruders without injuring them. Powerful and fearless, these dogs claim the number one spot on Dr. Coren's list for guarding families and homes today. The Doberman Pinscher was literally born to guard. The breed was engineered in Germany around 1900 to protect tax collector Louis Dobermann. These dogs are highly intelligent and, once trained, never forget a command. Their courage and obedience makes them highly valued as police and war dogs, as well as guard dogs. Rotweilers are high-energy powerful dogs who assisted their Roman masters as they invaded Europe. They are fiercely loyal and protective of their people and territories. They are confident and assess new people and situations carefully before acting, making them excellent guard dogs. The Komondor, a large, muscular breed, hails from Hungary, where they protected sheep and cattle with faithful vigilance for more than 1,000 years. Today's Komondors protect their human charges with equal tenacity. They are cautious around strangers but playful with their human families. Some refer to Komondors as "mop dogs" because of the corded appearance of their coats. Ancestors of the Puli also protected sheep in ancient Hungary. The breed is extremely smart, fiercely loyal and suspicious of new people and circumstances. Together, these qualities make them excellent guard dogs. The Giant Schnauzer breed was developed in Germany and guarded butcher shops and brewers. These dogs are smart, rugged and strongly territorial. They love their humans and feel responsible for their protection. Due to their highly trainable nature, Giant Schnauzers were used extensively in World War I. The German Shepherd is hailed by many as the quintessential guard dog. They are fiercely strong, agile and ready to serve and protect their human families. They make good companions and form strong bonds with children. 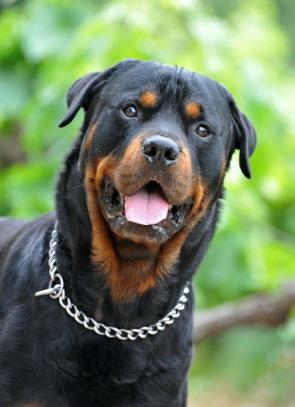 Ironically, the breed was developed as a show-dog in 1899 Germany, by Captain Max von Stephanitz. German Shepherds soared in popularity with the release of Rin-Tin-Tin movies. The Rhodesian Ridgeback loves his people and wants to be where they are. He is trustworthy, fierce and protective. His instinct to protect children is particularly strong. The breed was created in a region in Africa formerly known as Rhodesia to serve big game hunters who hunted lions on horseback. The dog's job was to flush the lions into the open for easier hunting. The dogs were also supposed to protect their masters from the wounded or otherwise angry jungle kings. The Kuvasz is large, muscular and fiercely protective of his human family. His instincts for protecting children are especially strong. These dogs are polite but not friendly, and they have a keen instinct to act at just the right moment. Kuvasz translates to "armed guard of the nobility," and his ancestors were owned exclusively by European and Hungarian royalty. Essentially, the Kuvasz served as a bodyguard to the king or queen. American Staffordshire Terriers love their human families and will fight to the death to protect them. They are extremely muscular, courageous and keenly aware of their surroundings. This dog was bred to work and needs an assigned role to occupy his focus. He is a cross between a bulldog, whose ancestors were used to bait bulls, and a Staffordshire Terrier. People refer to the breed by multiple names, including: Bull-and-Terrier; Staffordshire Bull Terrier; Pit Dog; and Pit Bull. The Chow Chow protects his humans and is affectionate with them. He is muscular, big-boned and keenly intelligent. The breed is also independent, aloof and not particularly eager to please. People generally think of the Chow Chow as an Arctic dog, but his ancestry goes back to the Chinese Han Dynasty, around 200 B.C., where he was a hunter, herder and protector. The Mastiff has valiantly guarded English homes for more than 2,000 years and is highly prized for his power, courageous, gentleness and loyalty. Don't mistake his tender side for a lack of tenacity. This is the same breed that Caesar forced to fight lions, bait bulls and even fight human gladiators.